Whenever Shaun can’t find me right away, he starts calling for me in a very pathetic sort of way. “Suuuuuuuzzzzzzzzzzyyyyyyy” he calls. “Oh Suuuuuzzzzzzyyyyyyyyyy ….where are yooouuuuuuuu…..” I almost always choose to ignore him. This is partly because of a blend of contrariness, amusement, perhaps a smidge of embarrassment and the desire to be left alone. This evening, I heard Shaun hollering for me upstairs. Of course, I couldn’t hear him. I was extremely busy watching the only television show I watch. (and it’s really dumb so I’m not saying what it is! Although I will say that I’m rooting for Lance…or maybe Warren, I’m not sure) Eventually, Shaun exhausted his search upstairs where I usually am, and after a quick peek to make sure my Jeep was still there, headed downstairs. He came around the corner and just stared at me for a moment before breaking into manical laughter. I’m quite used to this odd behavior from the man I married so I patiently paused my show and waited for him to calm himself. Shaun finally told me that I looked just like Snow White sitting in the forest with cute little birds perched on her and all the woodland creatures gathered around her. To be honest, I just looked at him like he was nuts. (Yes, he gets that look quite often from me!) Then I looked around and thought that maybe he might have a point. I didn’t have any birds singing to me, but there were a couple cats curled up on top of me. There was a guinea pig peacefully nibbling on her lettuce by my side. One dog was nestled right up against me while the other was at my feet along with yet another cat. I found myself giggling along with my husband. In fact, his silly observation lifted my mood so much that I invited him to join me. He took one look at what I was watching and instantly realized that he had something very, very, very important to be doing. So much for the first of my band of merry men. 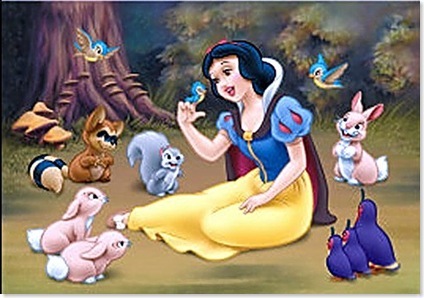 I guess I’ll just have to settle with being Princess of the Woodland Domestic Creatures…. This entry was posted in Critters, Family, It's all about me!, Love and Marriage, NaBloPoMo, Random stuff. Bookmark the permalink. Bless his heart ! I find The Man of the Place won’t sit on the sofa next to me no matter how tempting that may be if there is a program on the telly that he feels is beneath him to watch. Totally sounds like me. At any time, I’m surrounded by at least 4 animals and usually a kid or two. What a fun party you had … can’t wait to hear about the next one. Aww too bad he didn’t grab a camera..
I’m pulling for Brooke. Because she’s worked so hard and has looked so good with Derek. I wouldn’t be sad if either of the other two won. Warren just made me smile until my face hurt, and Lance has really fought back hard the past two weeks. We were disappointed in Lance & Lacey freestyle, tho. Have a Happy Thanksgiving Snow White.